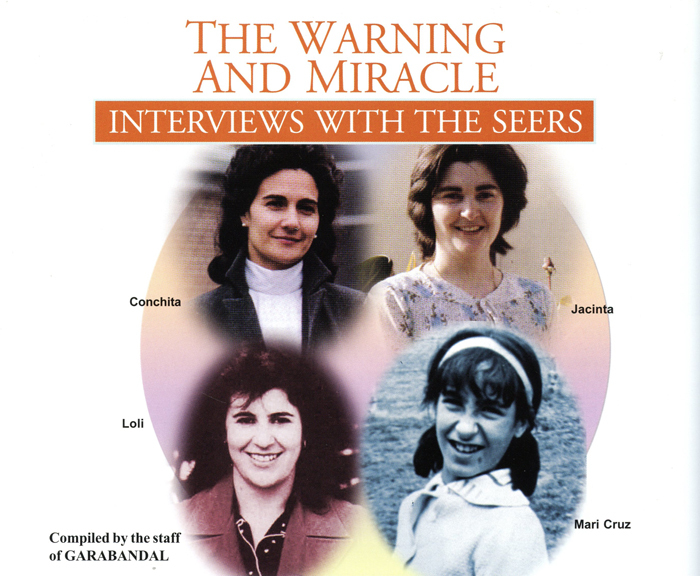 Since the apparitions of Garabandal ended in 1965, visionaries Conchita, Mari-Loli and Jacinta have, from time to time, granted interviews in which they have revealed what they are able to say about the coming worldwide Warning and great Miracle. In each of these interviews, although the same questions are frequently asked about the two events, it often happens that new or supportive information, or a different perspective comes to light. With this in mind, and in an attempt to get the most complete picture on the basis of what is known about the Warning and the Miracle, we have consolidated all the interviews to which we have access, avoiding, of course, unnecessary repetition. What follows is the result of our research with the segments from the various interviews given in chronological order. and experienced by believers and non-believers and people of any religion whatsoever. A. Yes, but I don’t know the date when it will occur. A. What I remember now is that the Virgin told me that before the Miracle God will be sending us a Warning so as to purify us or prepare us to see the Miracle and in this way we may draw enough grace to change our lives toward God. She told me what the Warning will consist of but not the date. I am not able to say what it consists of but I am able to say what it will be like, more or less. It is a phenomenon which will be seen and felt in all the world and everywhere; I have always given as an example that of two stars that collide. This phenomenon will not cause physical damage, but it will horrify us because at that very moment we will see our souls and the harm we have done. It will be as though we were in agony but we will not die by its effects but perhaps we will die of fright or shock to see ourselves. May the Virgin forgive me if I do not explain it the way it is, but I am trying to tell you … after knowing what the Warning will be like that day. Q. Did you ‘see ‘or ‘hear ‘about the Warning? A. I have never said that the Warning will be a short moment. What I have said is that even if it were a moment it will be very impressive and terrible. No one will have doubts of it being from God, and of its not being human. I, who know what it is, am very much afraid of that day. Q. Many years ago you told us the event of the Warning begins with the letter “A. ” Since Our Lady never told you not to reveal it, can you now mention it? A. She did not forbid it, but I don’t know why I haven’t said it and I don’t feel as though I should say it now. Q. You once said to Fr. Marcelino Andreu, (When you see the Warning you will know we have opened up the end of time. ” Can you explain what you meant by this? A. No. 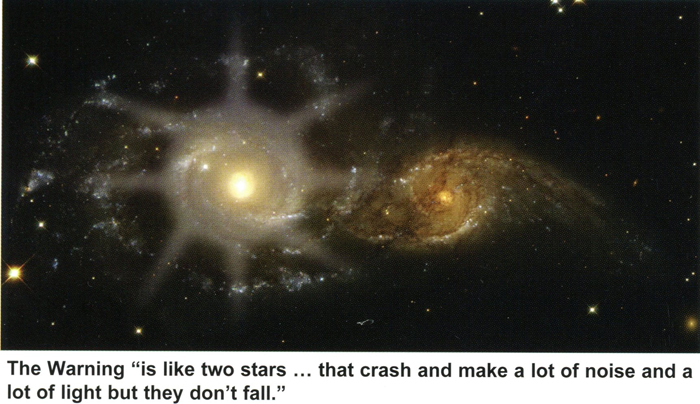 To me, it’s like two stars… that crash and make a lot of noise and a lot of light but they don’t fall… It’s something that’s not going to hurt us but we’re going to see it. In that moment, we’re going to see our conscience. You’re going to see everything wrong that you’re doing. Q. You ‘re going to see everything wrong that you are doing? A. No, she didn’t, but, because the Warning and the Miracle are within the same year, I feel it inside not to say anything. A. During an apparition — I don’t remember just when—the Blessed Virgin told me. A. Yes, but just for a few moments. A. Yes. Like everyone else.I have faults, and the Warning will show me my faults and this makes me afraid. Q. Have you ever discussed with Conchita the dates of the Warning of which you know the year, and the Miracle which she knows? A. To do much penance, make sacrifices, visit the Blessed Sacrament every day that we are able to, and to pray the holy rosary daily. A. … Everyone will experience it wherever they may be, regardless of their condition or their knowledge of God… It will be an interior personal experience. It will look as if the world has come to a standstill, .. .no one will be aware of that as they will be totally absorbed in their own experience. A. It is going to be something like an interior feeling of sorrow and pain for having offended God. God will help us to see clearly the harm we are causing Him and all the evil things we do. He will help us to sense this interior pain because often when we do something wrong we just ask the Lord’s forgiveness with our lips, but now (through the Warning) He will help us sense physically that deep sorrow. Q. Approximately 67% of the earth s land is now dominated by communism. Do you think that’s sufficient to fulfil Our Lady s prophecy? A. No, but what it looked like to me — maybe at this time I was confusing in my mind what I was seeing and what the Blessed Mother was saying to me because it’s been so many years — but what it looked like to me was that the Pope couldn’t be in Rome either, you know what I mean, out in the open. He was being persecuted, too, and had to hide just like everybody else. A. The Warning is something that is first seen in the air everywhere in the world and immediately is transmitted into the interior of our souls. It will last for a very little time, but it will seem a very long time because of its effect within us. It will be for the good of our souls, in order to see in ourselves our conscience, the good(1) and the bad that we’ve done. Then we’ll feel a great love toward our heavenly parents and ask forgiveness for all our offences. A. The Warning is for everybody because God wants our salvation. The Warning is for us to draw closer to Him and to increase our faith. Therefore, one should prepare for that day, but not awaiting it with fear because God doesn’t send things for the sake of fear but rather with justice and love and He does it for the good of all His children that they might enjoy eternal happiness and not be lost. Q. In the 1979 interview (above), you said in describing the communist tribulation that “it was like an invasion. ” Did you see scenes of this invasion? Q. 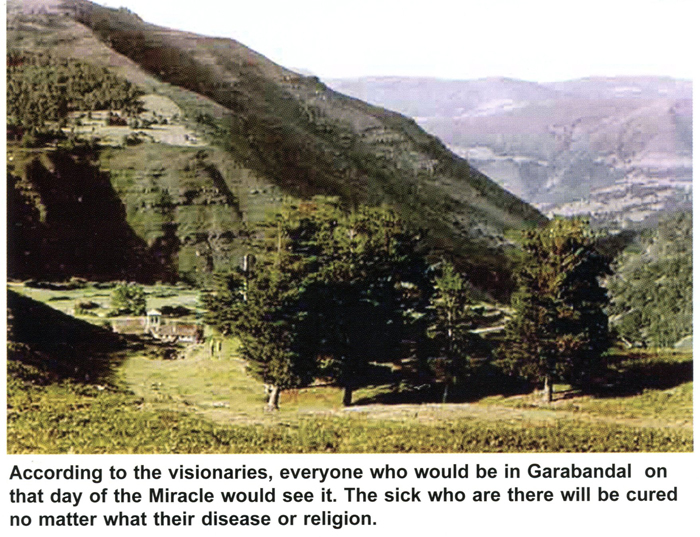 Will you and your family go to Garabandal for the Miracle? A. If it is God’s will. A. I will tell you all that I can just as the Virgin told it to me. She told me that God was going to perform a great Miracle and that there would be no doubt about the fact that it was a miracle. It will come directly from God with no human intervention. A day will come — and she told me the day, the month and the year so I know the exact date. A. It is coming soon but I can’t reveal it until eight days before the date. Q. What exactly is going to happen on that day? A. I am not permitted to say exactly what is going to happen. What I can reveal is that the Virgin said that everyone who would be there (in Garabandal) on that day would see it. The sick who are there will be cured no matter what their disease or religion. However, they have to be there. Q. On the day of the Miracle, did you say that those present would be converted? A. The Virgin said that everyone present would believe. They would see that this was coming directly from God. All sinners present would be converted. She also said that you would be able to take pictures and televise it. Also, from that moment on, there would be a permanent sign at the Pines that everyone would be able to see and touch but not feel. I can’t explain it. Q. On the day of the Miracle there will be an extraordinary sign not made by human hands? A. Yes. And this sign will remain until the end of time. Q. Did you say that this sign could be televised and photographed but not felt by touching? A. It will be like smoke. You can touch it but not feel it. Q. With respect to the sick people… the Virgin mentioned one particular person, a blind man called Joe Lomangino. What did she say about him? parents come from my town (Garabandal). This boy will also be cured. These are the only two people she mentioned. Q. Can you tell us something about Fr. Luis Andreu? Q. Fr. Luis was actually seeing the Miracle? A. Yes. That same day on his trip back home he said to his friends, “This is the happiest day of my life. What a great mother we have in heaven. The apparitions are true.” As he said these words he died. Q. Didn ‘t the Virgin say that something would occur on the day after the Miracle concerning Fr. Andreu? A. Yes, she said that on the day after the Miracle his body would be found incorrupt. Q. You have said that the Miracle of Garabandal will coincide with a great event within the Church. Did Our Lady tell you what that event will be, and can you add anything to what you have already said about this matter? A. Yes, I know what the event is. It is a singular event in the Church that happens very rarely, and has never happened in my lifetime. It is not new or stupendous, only rare, like a definition of a dogma — something like that in that it will affect the entire Church. It will happen on the same day as the Miracle, but not as a consequence of the Miracle, only coincidentally. Q. How will you announce the Miracle? A. I don’t know exactly. Most definitely at midnight (eight days before the Miracle) I will call Joey (Lomangino), radio, television, and anyone else in the world that I feel can help to spread the word rapidly. I am not worried. I know that if the Blessed Mother wants you there, you will be there. Q. Joey has said that he will go to Garabandal immediately after the Warning. Do you know how much time will pass between the Warning and the Miracle? A. For Joey to go to Garabandal is a good idea, but I don’t know how long will pass between the Warning and the Miracle. Q. Do you think of the day of the Miracle often, and are you anxious for the Warning and the Miracle to come? A. Sometimes I think of it as so imminent, sometimes far away. It seems so near when I think that people are not answering the Message, because after the Miracle there may come the punishment. I am anxious, yes. I wait. The Blessed Mother never lies. For the words of the Blessed Mother to be complete, there must be the Warning and the Miracle. It is all one message. say anything in addition about his eyes? A. Concerning Joey, the only thing I remember now is that the Blessed Virgin said to me that at the moment of the Miracle Joey will have new eyes, and he will see permanently after that. Q. Did you ‘see’ the Miracle or were you told about it? A. The Virgin told me of it and made me understand exactly what it will be. Q. Were you alone or with the other girls when Our Lady told you about the Miracle? Q. What will the Miracle be like? A. Even if I would try to explain it, I wouldn’t be able to do it well. It is better that you wait and see it. Q. It is said by some people that the way you will announce the Miracle will be a ‘miracle’ in itself. Can you explain this? A. I believe that the way in which it will be said will be another miracle because it is a very great responsibility for me and I will need a miracle to say it. Q. If I am situated far from the village in the mountains, but I am able to see the Pines, will I see the Miracle clearly? If I am sick will I be cured at that distance? A. You will be able to witness the Miracle clearly, and if God wills it you will be cured. Q. Some people have said that in other places in the United States and Europe people could visit Marian shrines and be cured on that day. What do you know about this? A. The Virgin didn’t tell us anything about this. Q. Will those who are firm believers in the coming Miracle but unable to attend because of their state in life, for example, cloistered priests and religious, receive any special graces on that day? A. I don’t know personally. It depends on those people; of their wishes, or their faith, or their sacrifice or their obedience. Q. Did Our Lady ever say anything about the vast sea of people who plan on being in Garabandal several days before-hand? Many are concerned as to how they will manage for their food and toilet facilities. Do you have any comment? 1 Conchita says we will only see the bad. 2 Conchita was expecting her first child when this interview was conducted and gave birth to little Conchita (Conchitina) the following April. 3 Ed. Note: According to the notes of Fr. Valentin Marichalar, pastor of Garabandal during the time of the events, Conchita was alone when she received this communication. Study on a New Energy Cheap and Globally Available for people with Less Resources.